Welcome to House and Home! Yorkshire's destination home and garden store is now online; after serving Wensleydale for over 50 years, House & Home now caters to the entire UK. Our stores stock everything you need for the home and gardening; from household essentials, cleaning products and DIY to kitchen utensils, cookware, dinnerware, gardening and toys. We stock several varieties of items, from budget lines to more recognisable brands such as Denby, Breville and Royal Worcester. Make your own jam? We have the maslin pans, strainers and jam jars to store it in. Looking for that special something as a gift or to remind you of your time in Yorkshire? Our extensive ranges of figurines, fine china mugs, photo frames and albums suit all tastes and budgets. In these days of mass-markets and mega-stores, shops that boast character with varied stock feel hard to come by. Those so-called “Aladdin's Cave's”, passed down through generations, are in-fact thriving in the North Yorkshire market towns of Leyburn & Bedale. Wray Bros, of Leyburn, still has flagstone flooring while House and Home Bedale has recently undergone restoration work, putting the look of the store back to its times as the Town Hall. It all started in the late 19th Century at a sweet shop in Masham, North Yorkshire, owned by Master-Tailor William Leathley and his wife, Mary. Following retirement during the First World War, the shop was taken over by Mrs Annie Agnes Leathley; her husband George Harold set about expanding the business through attending local markets and shows with new lines of ice cream, sweets and biscuits. Come 1956 their son, Reg, moved his family further into Wensleydale and established a business of travelling shops all over the Dales, and in 1971 opened a small shop in Leyburn. Their son, Ian, moved to a larger establishment in 1978, becoming the first self-service store in the town and eventually growing to 20 supermarkets. A second hardware shop was opened in Bedale in 2003, and a year later all 20 supermarkets were sold to one of the country's leading retailers. Both hardware shops have flourished since opening and the business is now well into its fifth generation of the Leathley family. House and Home has since expanded and now has 2 shops in Leyburn North Yorkshire. Please note that our stores are unable to help with website enquiries. House and Home opening hours are subject to change on bank holidays and festive periods. House and Home Bedale Opening Hours: Monday - Saturday 9am-5pm; Sundays 10am-4pm. 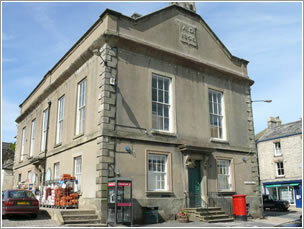 House and Home Leyburn Opening Hours: Monday-Friday 9am-5:30pm; Saturdays 9am-5pm; Sundays 10am-4pm. Opening Hours: Monday-Friday 9am-5:30pm; Saturdays 9am-5pm; Sundays 10am-4pm. - Choose your favourite colour for inside walls, wood, metal and exterior surfaces. We stock Johnstone's paint, and use our paint mixing machine for other shades on our colour swatches, as well as matching colours from other premium brands. Matt and silk emulsion, gloss, eggshell and soft-sheen paints available. - Replace tired keys or have more cut for family members and neighbours if you're going away on holiday. Yale key cutting for patio doors and secure Euro locks, mortice key cutting for interior doors and older mortice locks. We also stock key fobs and key covers for personalising your keys and making them easier to identify. - Machines available for hire, complete with sachets of cleaning powder. Our carpet cleaner hire uses Karcher carpet cleaning machines and produce excellent results, whether it's cleaning dirt and dust from carpets or refreshing old flooring. Contact our stores for pricing and availability. - Drop off your garments at House and Home Bedale to be sent to a professional dry cleaning company, and pick up next time you're in town. - Our local shops in Leyburn and Bedale have a full range of utensils, kitsch, pots and pans for the kitchen. Wood, plastic, metal & silicone kitchen utensils; aluminium, stainless steel, enamel & cast iron saucepans, stock pots, frying pans & casseroles from leading brands. Plenty of trivets, aprons & oven gloves and other kitchen kitsch to browse. - Full collections from breakfast to dinner, from brands such as Denby, Portmeirion, Royal Worcester and Maxwell & Williams. Choose from dinner plates to side plates or all sizes, in fine bone china to porcelain. Egg cups, butter dishes, cheese plates, tea pots and cups and mugs. - From Kilner jars to Thermos flasks, there's plenty of ways to store jams and chutneys made from fruit and veg in your garden as well as home-made cakes and storing hot beverages. - We stock clocks, ornaments from Willow Tree, Border Fine Arts and Royal Crown Derby, vases and figurines. Great ideas for gifts and inspiration. - Stuck for an idea for Christmas or birthdays? Lots of Lego available as well as jigsaws and fuzzy felt. Outdoor spots goods like swingball, netball, crickets and football. Or if you're into vehicles, we have farm toys like tractors and diggers to lorries, cars and helicopters. - Hand trowels and digging forks, rakes and bamboo canes. Gardening gloves, wellies, footwear and hose fittings. We even have bird feeders and seed to fill them with. Come and see us for compost, fertilizer, seed potatoes, bulbs and pest control. - Keep stocked up with cleaning chemicals, sprays and powders for the kitchen, bathroom and all interior and exterior surfaces. Bleach and Jeyes fluid plus the rubber gloves, mops and brushes needed to use them. Gather dirty clothes with our laundry baskets and keep rooms tidy with Brabantia's bins for the home. - Visit our shops for ultra low energy lightbulbs and DIY items such as wire, junction boxes, door bells, extension leads and plugs for shavers and for converting European plugs. Our kitchen electricals department offers the full range of appliances from kettles and toasters, coffee makers, stock pots and slow cookers, mixers and food processors, pressure cookers and steamers. All this and more, under one roof. Visit House and Home Bedale North Yorkshire, just off the A1 at Leeming, and House and Home Leyburn at the gateway to the Dales.